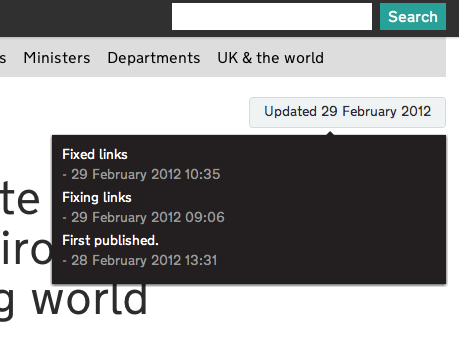 It can be pretty frustrating when you see words like “Page updated 1 Aug 2012” with no indication of what’s changed. So that’s why whenever someone updates any page on Inside Government, including specialist guidance, we require admin users to enter a short note of what’s changed. We display this note on the front end website so users can see if the change is relevant to them. With this small feature, our aim is to remove user frustration, promote transparency and improve trust. Later, we will also include the change note in feeds and email alerts. Minor edits, eg to fix links and typos, will not be displayed. We released an early version of this on the Inside Gov beta back in March, and we’ve improved on it recently to cut down on superfluous information. The button to reveal change notes now only appears if there has been an update (ie, it’s not there at all when the document is first published), and we’ve removed some duplicate information about dates. For content migrated from legacy websites, we’ve also stopped showing the date that the document was first added to GOV.UK in favour of the date it was originally published.